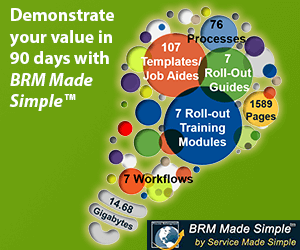 On a global scale, BRMs, CIOs, and other business and IT leaders look to BRM Institute as the leading resource for staying up-to-date on the most advanced BRM content, knowledge, and skills. Launched in August 2016, the BRM Contributor Network provides an exclusive platform for BRM Institute Professional Members to share their expertise and establish themselves as thought leaders on topics and issues that affect BRMs every day. BRM Institute will not sell, rent, or lease your personally identifiable information to others without your permission. BRM Institute will not use or share the personally identifiable information provided to us for purposes other than for which the information was originally submitted, without your express permission. We will also provide you the opportunity to inform us at any time if you choose to opt-out of partial or total contact from BRM Institute and we will comply with such requests. The BRM Contributor Network is a program available exclusively to Professional Members. Learn more about membership options here. You don't have to fill this out right now, but please feel free to include a short bio if you'd like. What are some topics you'd be interested in writing about? Feel free to get creative! The sky's the limit--if you want to write about work-life balance as a BRM, the impact of gender in business and IT, team-building tips, BRM career paths, mistakes you've made and how you've learned from them, etc. then go for it! If you write it, chances are there's someone out there who wants to read it. Enter LinkedIn username like "Business Relationship Management Institute"
Enter Twitter handle like "@BRMInstitute"